and have also produced collaborative visual works. the two went on to graduate study at U.C. San Diego, receiving their MFA degrees in 1977. 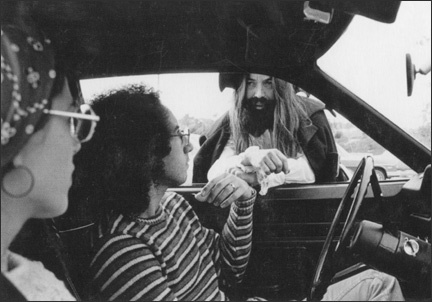 During that time, they worked with David and Eleanor Antin, Fred Lonidier, Harold Cohen and Allan Kaprow. the creation of the Lagoon Cycle portfolio, and helping with exhibition installations at Ronald Feldman gallery. T&M learned from the Harrisons how members of an artist couple could be both critical and supportive. as part of Art Against Apartheid, PAD/D and a variety of other politically oriented artists groups. T&M have shared visiting artist residencies at the Vermont Studio Center and the American Academy in Rome. and at other professional meetings. From 2014 through 2016, they co-directed TandM Arts: Studio, an alternative exhibition space in Philadelphia. nature of their collaborative process. An updated version of the interview can be read here. photographed by Phel Steinmetz as part of Antin's performance "The King of Solana Beach"